Grady grew up with music in his life from a young age. His mother enrolled him in piano lessons at age four and by age ten he had begun studying classical percussion. In middle school he heard the album Mercy, Mercy, Mercy by Cannonball Adderley and knew he wanted to play music for the rest of his life. Throughout high school he played with some of the top ensembles in Utah including: Cresent Super Band, HYPE, and All-state Band. 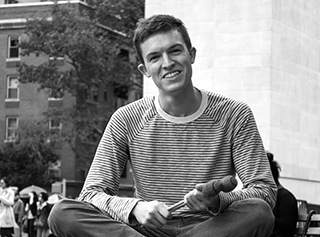 Following high-school he earned his bachelors degree at the NYU Steinhardt Jazz Studies program under the direction of Dr. Dave Schroeder and Dave Pietro. There he studied with jazz legends John Scofield, Joe Lovano and Stefon Harris. Over the course of his career he has traveled around the world playing at festivals in Europe, South America and North America such as: Umbria Jazz Festival, Montreaux Jazz Festival, Costa Rican International Jazz Festival, Salt Lake City Jazz Festival and others. He has also participated in the following renowned artist residencies: Betty Carter’s Jazz Ahead (under the direction of Jason Moran) and the Boysie Lowery Jazz Residency. He now freelances in the New York as an up-coming young musician, composer and teacher. I feel a student learns best when they feel the joy of playing and have a teacher that encourages and believes in them. As they become more connected to the instrument then the learning and practicing side of music becomes like an adventure! The thing I most enjoy from teaching is learning from my students! Teaching is like being in a musical laboratory together with the student where we both find out new things about music and life.